Norris Geyser Basin is a composite of some of the park's most unpredictable and fascinating geothermal attractions. Its 2½ mile interpretive trail system takes the visitor past thermal geysers, rainbow colored hot springs and impressive fumaroles that make up Yellowstone's hottest features. Steam escaping from Black Growler Steam Vent often reaches over 200 degrees F in temperature. Steamboat Geyser, Yellowstone's largest geyser, can reach more than 300 feet into the air. Congress Pool, known for its soothing blue color, can erupt into a roiling cauldron of mud and steam at a moment's notice. Such is the mysterious and often temperamental nature of the Norris Geyser Basin complex. 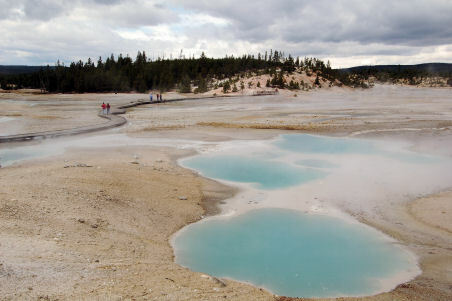 Norris Geyser Basin also is significant for its contribution as a U.S. Calvary outpost during the late 19th century. The Museum of the Park Ranger and the Norris Geyser Basin Museum stand as testaments to the area's two most enduring features: the earth's unpredictable nature and Mankind's role as its beneficent custodian. Although there are no restaurant or hotel facilities at Norris Geyser Basin, numerous picnic stops surround the complex. A visitor center sits at the center of the complex, with linking trails to its nearby campground and Museum of the Park Ranger. Hotel facilities can be found at Canyon Village (12 miles east) and the Old Faithful visitor complex (30 miles south), reachable by Yellowstone's scenic Grand Loop Road. This, Yellowstone's most active geothermal area, is located on the west-central side of the park, 14 miles north of the Madison visitor complex and 28 miles northeast of the town of West Yellowstone, Montana.